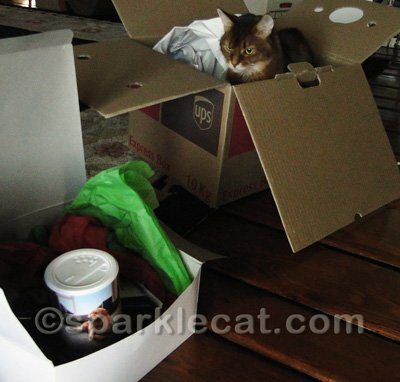 We got a surprise package from the Oreck human who helped me with my air purifier contest a few weeks ago. It was some carpet freshener and stain removal wipes, all gift-wrapped. My human liked it, but I am wondering if I should be a little bit insulted. At least it came in an exceptionally cool box! There were more surprises too, like this gift my human wrapped for her boyfriend. It is protected in heavy cardboard because it is 112 years old and very valuable! She wasn’t expecting to find it and was quite surprised when she found one — and he will be surprised to get it, too! 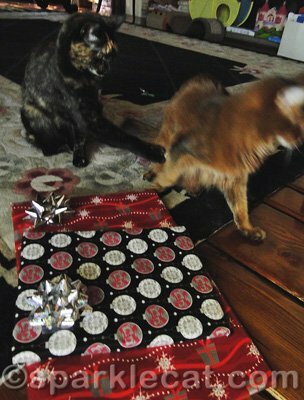 I had to supervise the wrapping very carefully, but I don’t think my help was properly appreciated. 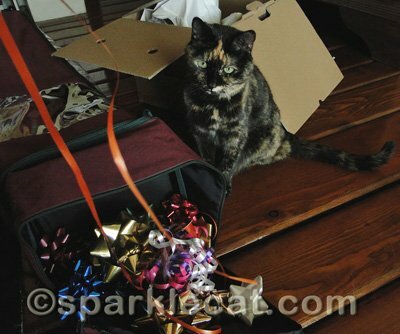 Binga helped with choosing bows. 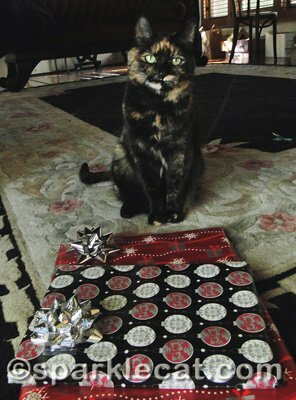 She bit all the ribbons because they were the wrong color for the wrapping paper my human was using. All this wrapping was hard work! 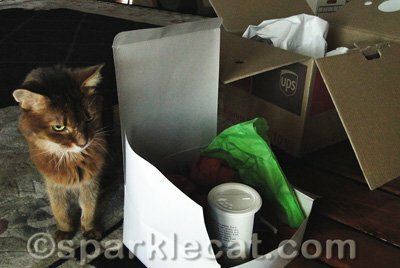 Yes, it was only two packages, but you don’t know my human. 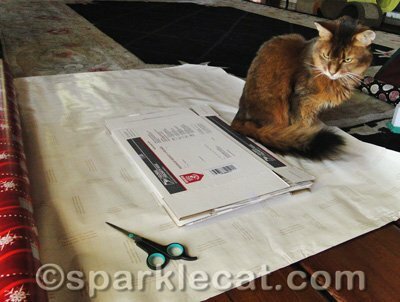 Then Binga and I got into an argument over who did the most work. It is a good thing that misbehaving kitties still get presents, otherwise Binga would wind up empty-pawed on Christmas Day! You can come and wrap gifts with us any day; we’ll provide extra paper for shredding. Oh, dear, a wrapping battle on Christmas Eve. Good thing there aren’t any more packages to wrap. Jan doesn’t appreciate our help either. Merry CatMouse sweet Sparkle, I hope you get everything you asked for! Have a super holiday, Sparkle! I don’t know where humans would be without you kitties, arguments and all. I hope all of you have a great Christmas. And I’m with JB–what was 112 years old? Ooh, what is 112 years old? Purrhaps artwork? That box is outstanding. I hate it when my sibs try to take charge too. It’s also a good thing misbehavin’ adults still get surprises! Nice post. Looks like you both did some good work! Please share pics of tomorrows festivities! Merry Christmas! I cannot wait to see a present that is as old as the publicist! That was a lot of work for the two of you. We think Santa will give you extra presents for being such good helpers!! Sparkle ! My mom will wrap presents today which is 25 of Dec, Could you believe ? 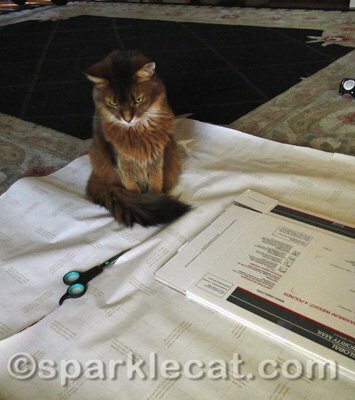 Your human definitely does not appreciate what great helpers you and Binga are! You and Binga needn’t get into an argument. It’s not who did the most work but the both of you doing a great job wrapping presents equally. We forgot to wish all of you a Merry Christmas! You both helped out a lot wrapping the presents! Binga, we know you aren’t misbehaving, just misunderstood! We love the last photo! We’re curious as to what your human got her boyfriend that is 112 years old. We can’t tell until after he’s unwrapped it! I hope y’all will ‘gather’ next week at the new Saturday PhotoHunt site. I hope to see y’all next Saturday! 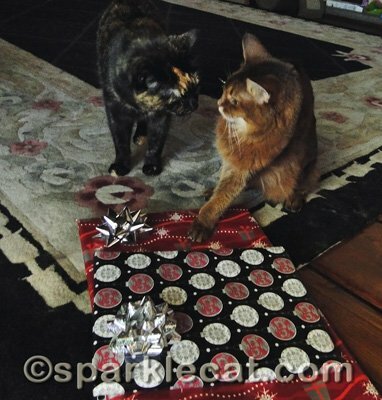 Our mom says she can never wrap presents with us around, Sparkle! We don’t know why…with us around, she has lots of help. Well I think you both did a great job helping out!!! Binga, you really shouldn’t pick on Sparkle because all the gang here will teleport right over there to put you in your place. Sparkle is our gal and we don’t like seeing her being picked on.It is Christmas and you had better be good. We sure do wish all of you a very Happy Holiday..
We wish you all a very Merry Christmas and lots of beautifully wrapped presents! Wishing you and everybuddy over there a wonderful Christmas…. Have a super day. 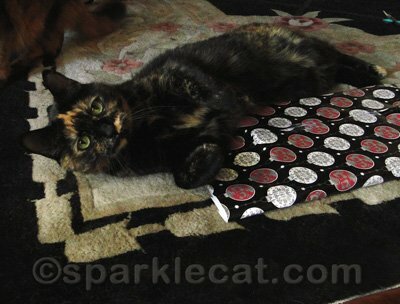 Sparkle, our Mommy was a champion wrapper…until we came along! Now she shoves gifts in a sack and hopes we don’t maul the tissue paper too badly!